Painting your front door is a quick project that should not take more than a couple of hours. This is not only a quick and reasonable project, but it can really make your house stand out on your street. You can do a subtle color or be brave with a vibrant, colorful hue! Painting your front door is a great way to own your house and personalize it to your taste this summer. Planting flowers is a great way to show that you care about your lawn. Flowers can be hung from baskets on your home’s porch or planted in a garden. You can even add herbs to your garden for further use in your kitchen. Planters are another great option you can add to your home’s exterior. This project should not take you longer than your weekend and can make quite the impression on your curb appeal. If you have patio furniture and have not stained it yet this year, try making it a project this weekend. Patio furniture can quickly become weathered and in need of staining. Sand your patio furniture thoroughly before staining to ensure that it will stay. Staining will do wonders on how different your furniture will look after being stained. Mulching your flower beds and around your trees can present a clean, well-kept look. You can even get woodchips or gravel as well as an alternative depending on your local environment. Adding these to your yard can really make your landscape more aesthetically pleasing. Building a firepit is a quick and easy project that can also be used for entertainment. Adding a stone firepit to your yard can be a fun project with a reward at the end. Firepits are great for having over friends and enjoying the evening weather. All these projects can be done in a single weekend. They are quick and easy, yet the reward is very satisfying. 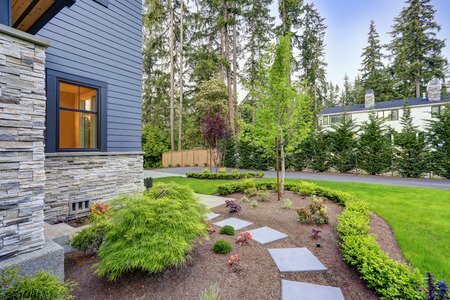 Keep in mind your landscape this summer and try out some of these fun projects to amplify your curb appeal. This entry was posted in Outdoor living by creatingyourspace. Bookmark the permalink.